??? 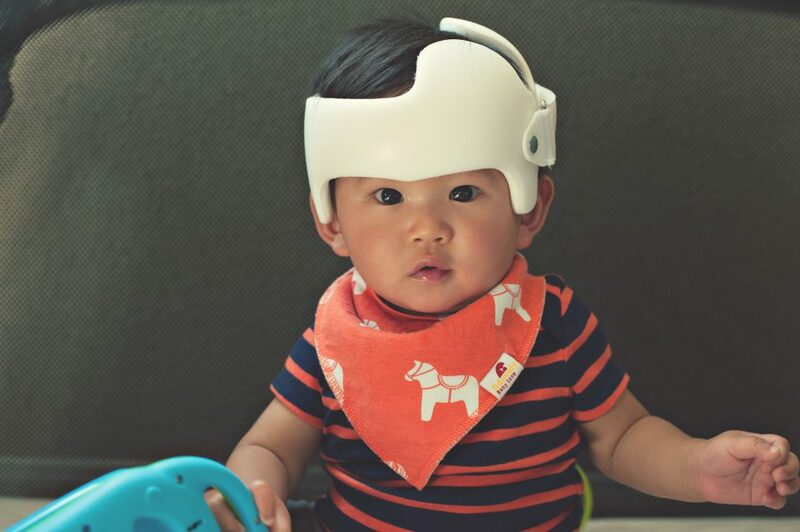 Did your kid injure his head ??? Of course, my husband being the way he is, he’d often respond with “I dropped him when he was small”. HA HA HA.. of course. But… usually “did your kid injure his head? or “did he hurt himself?” are the first two questions we’d get asked when people are curious enough to ask. How could you not find him cute? I know… my head is too swollen with pride :). I would honestly say.. I didn’t. It was definitely something we had to learn as we went along. And, ironically, in the 100s of people we know, and the churches we’ve been to, we didn’t know of one single family that had a child in a helmet. So… this was definitely something we had to learn from scratch. He has definitely been our bundle of joy. He graced us with his presence on October 08, 2015. 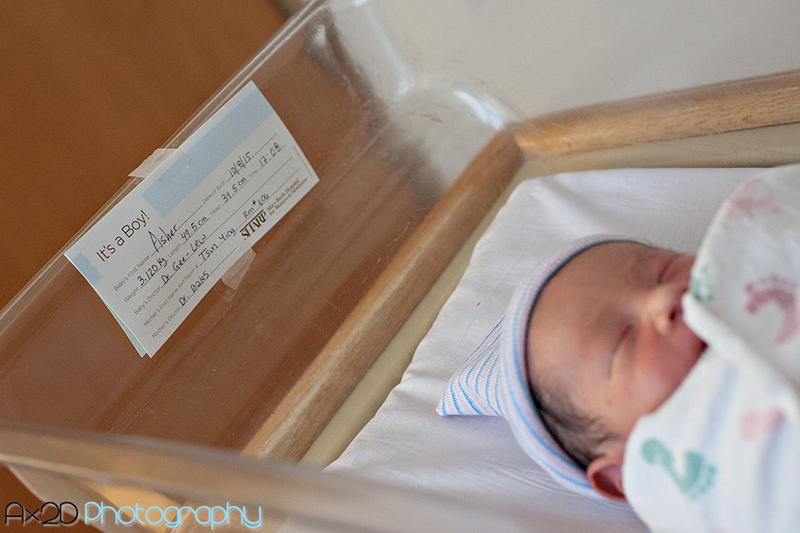 It was another long labor between 4-8 cm, but when he finally decided to come out, he came quickly with 4 pushes/10 minutes. How did we find out we needed a helmet? Within 2-3 months, Asher began to sleep, off and on, 6-9 hr stretches at night. Because he was such a great sleeper from the beginning, his head slowly started flattening on the left side. With all his hair, many probably didn’t even notice that this was happening. But for us, we saw that he would constantly sleep or roll his head to the flat spot. 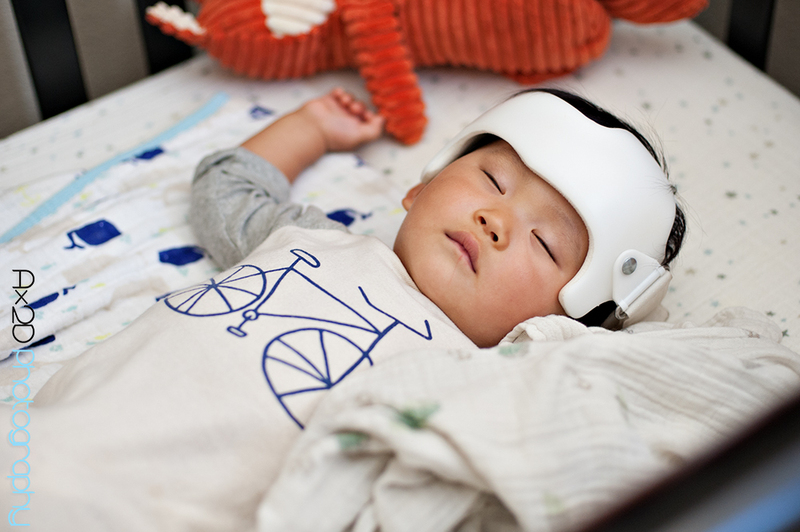 Because of a combination of events, by the time our pediatrician caught it, it was too late to correct with other methods – both because he was much too mobile to reposition his sleep and his head was far too flat that he would automatically fall/turn onto the flat-spot during his sleep. If we caught it earlier, when he was younger, we might have been able to prevent it or correct it with other methods, but because we didn’t catch it earlier, we either had the choice to allow his head be flat, or to get the helmet. We scheduled the consultation that same week. In truth, we didn’t know what to expect. We didn’t have any close friends – or even distant friends – who had to “go through this”. And in our numerous outings, I think I’ve only seen one or two children with a DOC band on. If I did pay attention to it, I didn’t really understand what it was for or even cared to ask. With all the unknowns and questions, we went in with open minds. We simply wanted Asher to have the ability to grow and develop the best that he can, without any hinderances to hold him back. 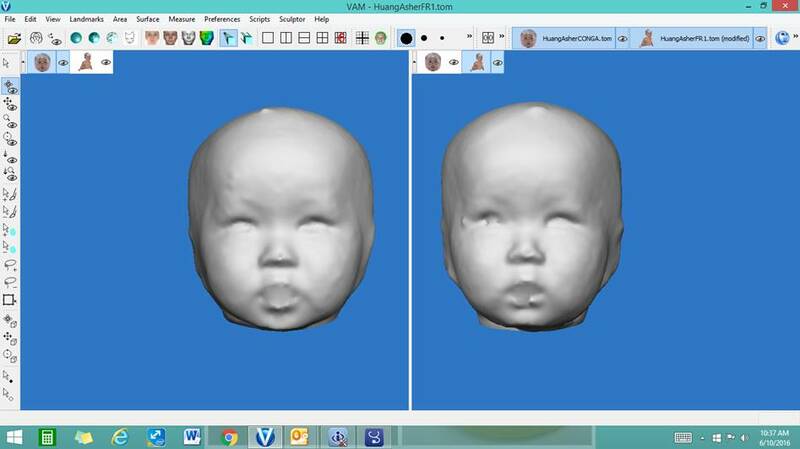 1) What is Plagiocephaly (play-gee-oh-sef-uh-lee)? 1) “BACK ONLY” sleeping to reduce SIDS – a campaign that started in the 1990’s. 3) Too much use of baby swings, carseats and other “convenience devices”. 4) Not enough tummy time. 5) Not enough baby carrying. 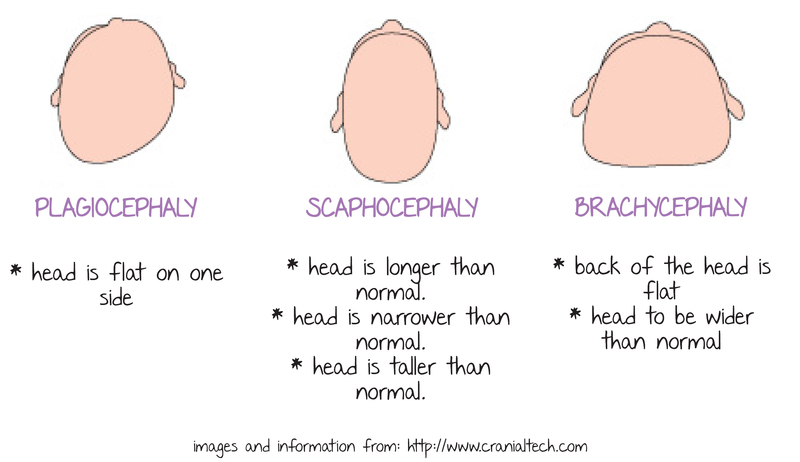 2) Congenital torticollis – neck muscles are tight, causing baby’s head to tilt to one side more than the other. 1) We should have alternated side and back sleeping when he was younger. Of course, this brings up the question of.. what if he turned on to his tummy when we weren’t watching. I think that was the reason why we didn’t do this. I also tried for a little bit and saw that his sleep was not for the better. 2) We shouldn’t have put him in his rocking chair so often. He was sooo good sitting there and just playing. Of course, he didn’t really sit there for that long, but we did use it quite often. 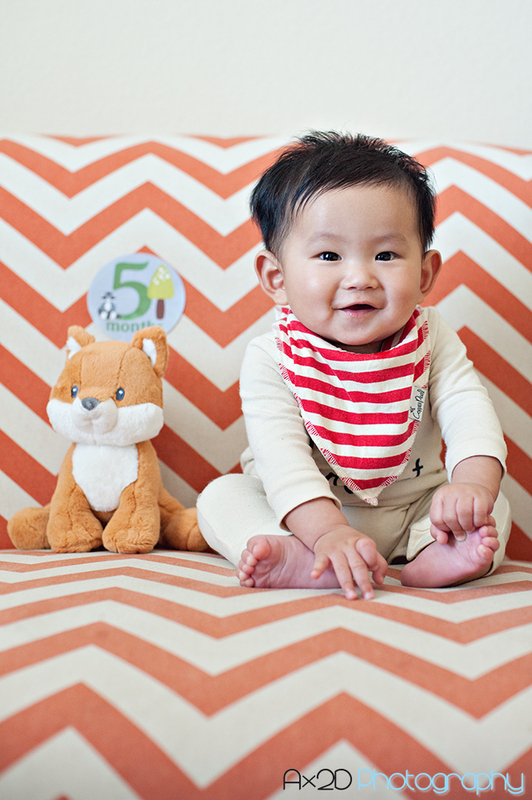 3) We should have done even more tummy time with him. As much as he would let us. He hated it. Even now he would rather walk than crawl. 4) We should have carried him more often. Even in a carrier, Asher went from 6 lbs 14 oz to 10 to 20 lbs quite quickly. It’s pretty hard to carry around such a heavy and big baby. 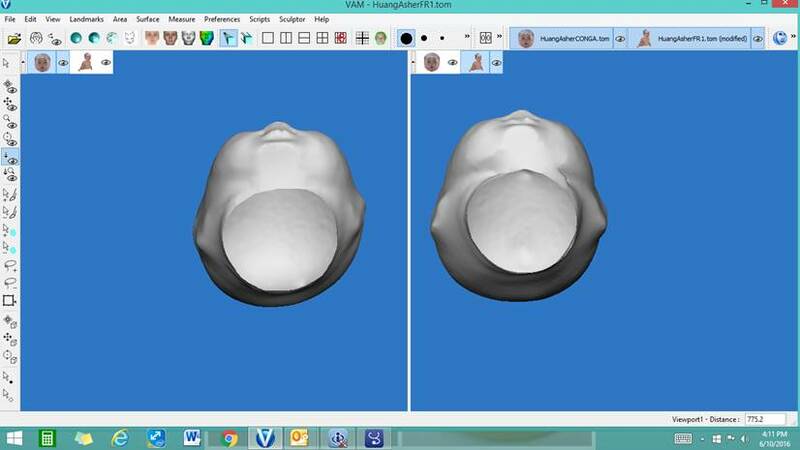 3) How often does plagiocephaly occur? 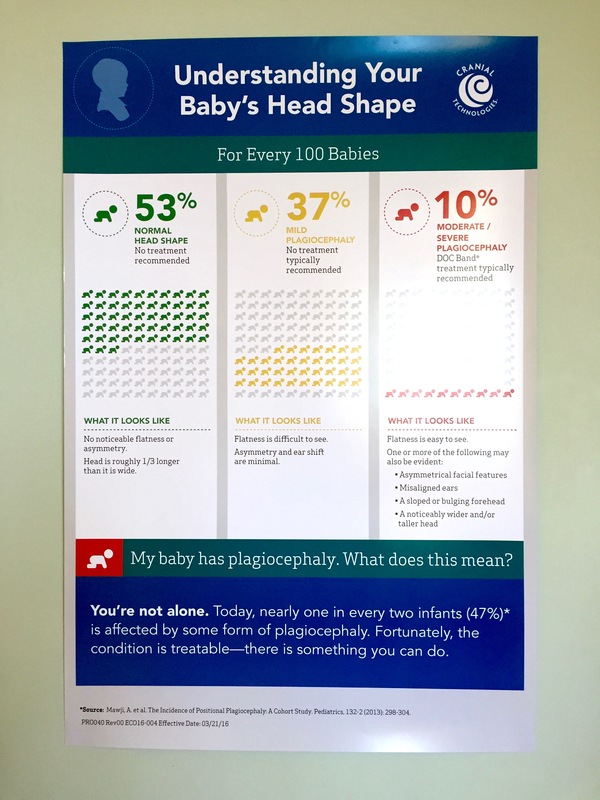 Flat-head occurs almost one in every two babies (47%). The differing severities cause 1 in 10 to actually require treatment. Even though it’s supposed to be more common than not, both my husband and I have only seen children wearing DOC bands probably less than a handful of times. We don’t quite know why, and thought that once we’ve joined the DOC band group that we’ll see more, but honestly, we haven’t seen any at all. 4) What is the treatment? 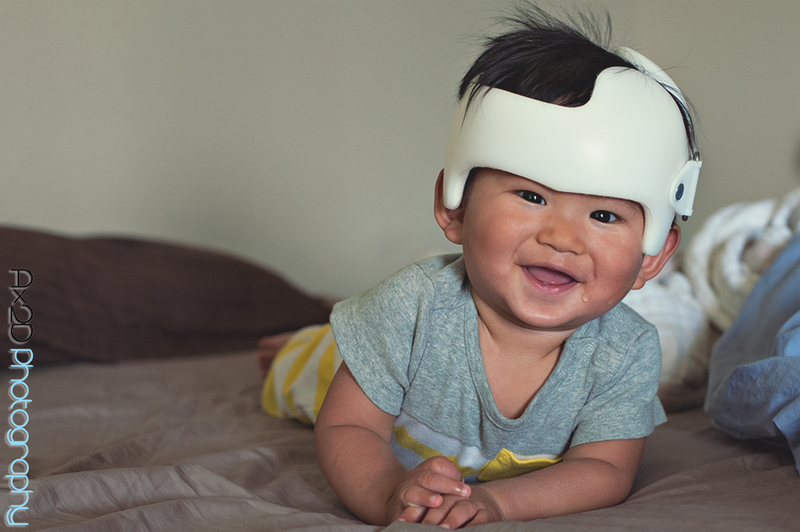 The primary treatment for plagiocephaly is using the Dynamic Orthotic Cranioplasty band or commonly known as DOC band. 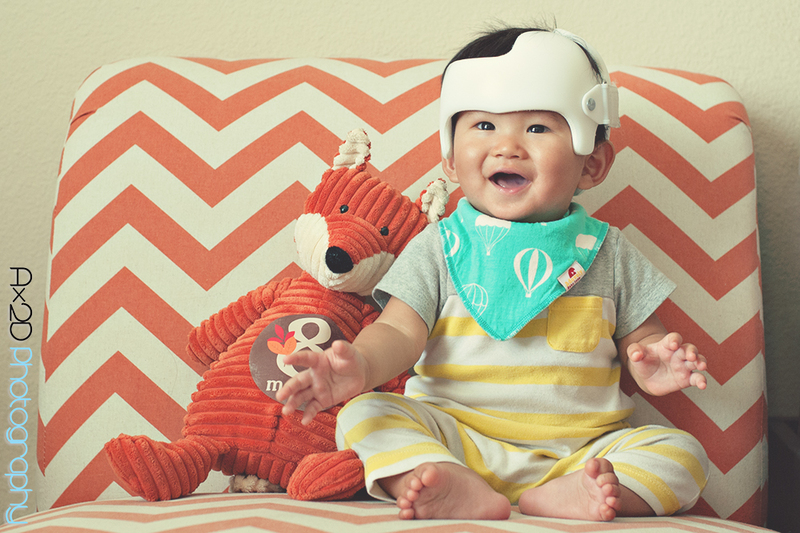 The DOC band is a made with hypoallergenic foam on the inside and plastic on the outside. It is fastened by velcro. Each DOC band is custom made for each child, and applies light pressure to redirect natural growth. The overall weight is less than 6 ounces and is worn for 23 hrs a day – with one hour rest for bath time and helmet cleaning. 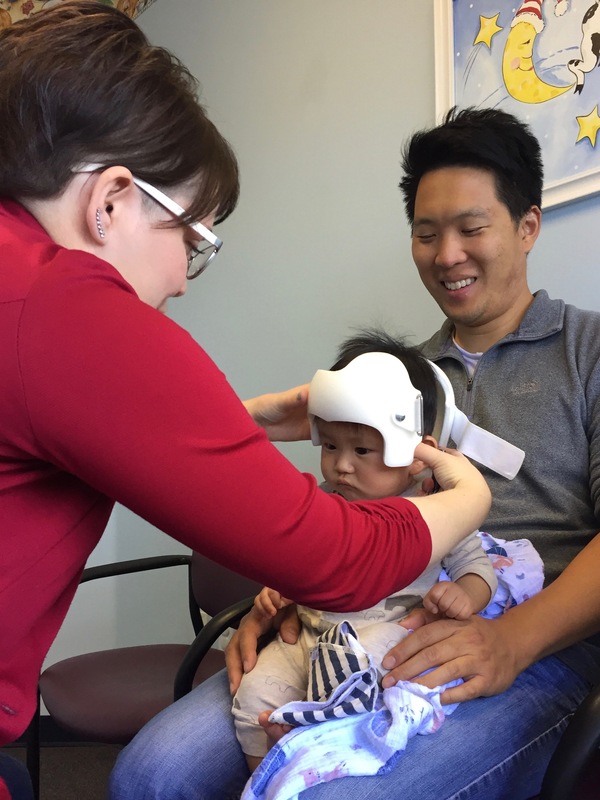 5) What should you expect on your first visit with your cranial clinician? 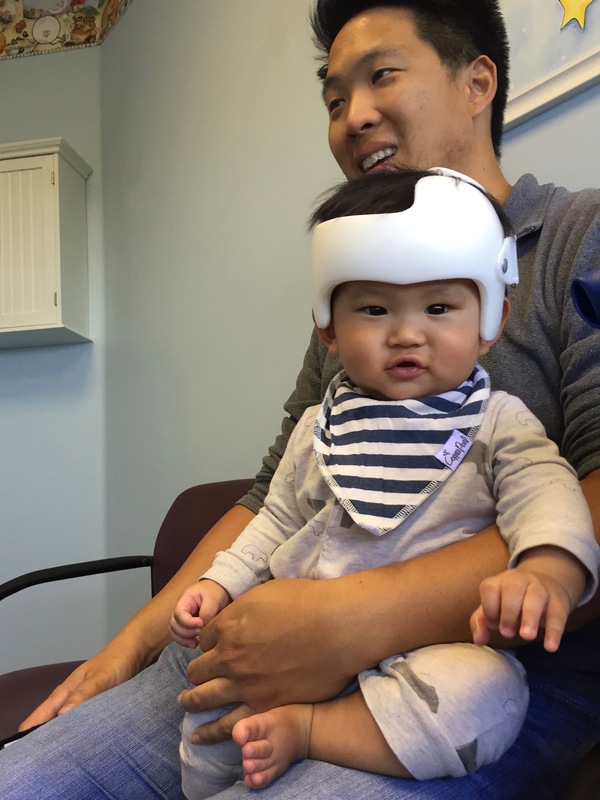 On our first visit to the Cranial Technologies in San Diego, we were brought into a consultation room. 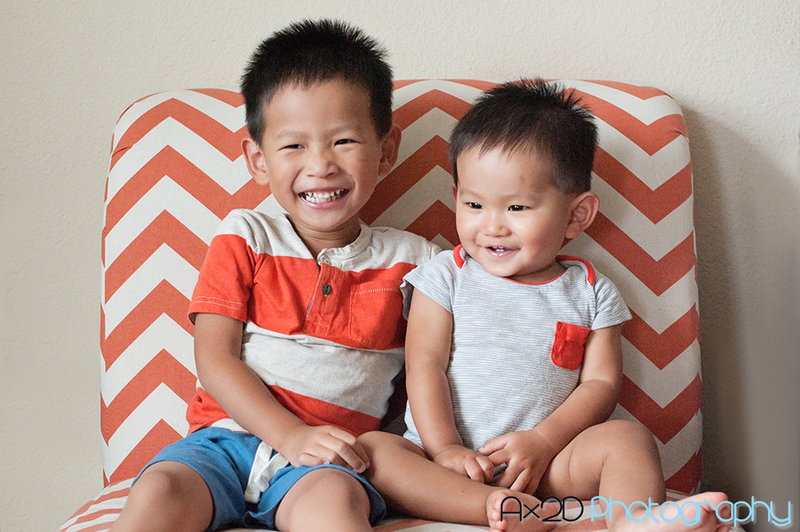 We got to meet the person who would oversee Asher’s treatment. 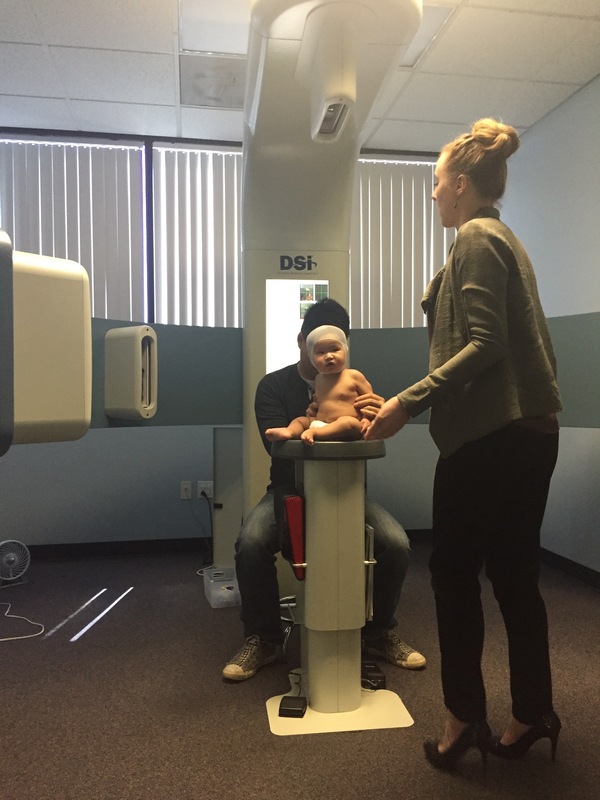 In order to find out the “severity” of Asher’s case, we were told to take off all his clothes, except diapers, so they could take some images of his head. We were brought into a room with a BIG MACHINE. He was fitted with a mesh sock in order to get a more accurate photo of the contour of his head. 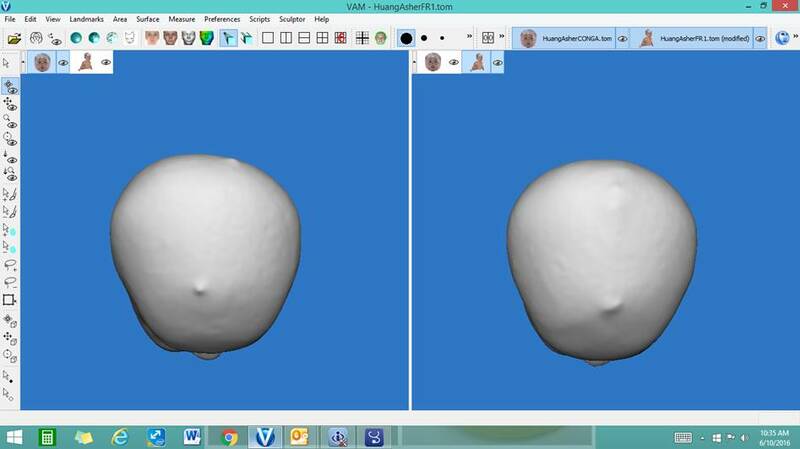 Using the DSi system – Digital Surface Imaging – a machine with 15 high resolution cameras – they were and recreate a 360° photo of the skull up to a .25 millimeter accuracy. 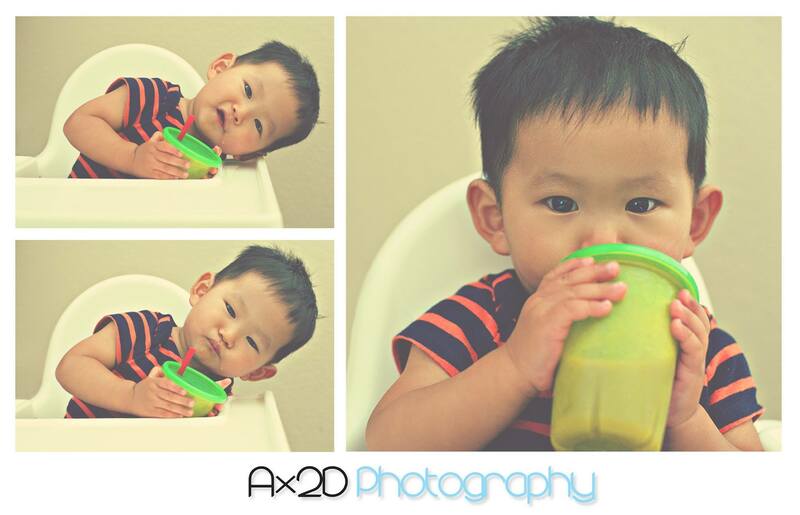 The images below are samples of Asher’s head. A before (6 MO) and after (8 MO). These images below shows the progress of just 1.5-2 months. 🙂 It’s crazy how much changes. 1) his right ear to become slightly lower than his left, and his left ear shifted a little forward. Once we agreed to do the DOC band, they contacted our insurance. Once insurance was approved they sent the information to the manufacturer to create the custom DOC band. The helmet arrived within 2 weeks and that was our first consultation and fitting. For Asher, he required little or no adjustment at all. He barely knows it’s here. Occasionally he’ll touch it, but otherwise, it doesn’t phase him. Overall, the helmet does add a little extra weight so most babies will need to “get used to it” a little. Even though it’s <6oz, it’s still added weight on a neck that needs so much strengthening, everyday, to hold up their large head weight! 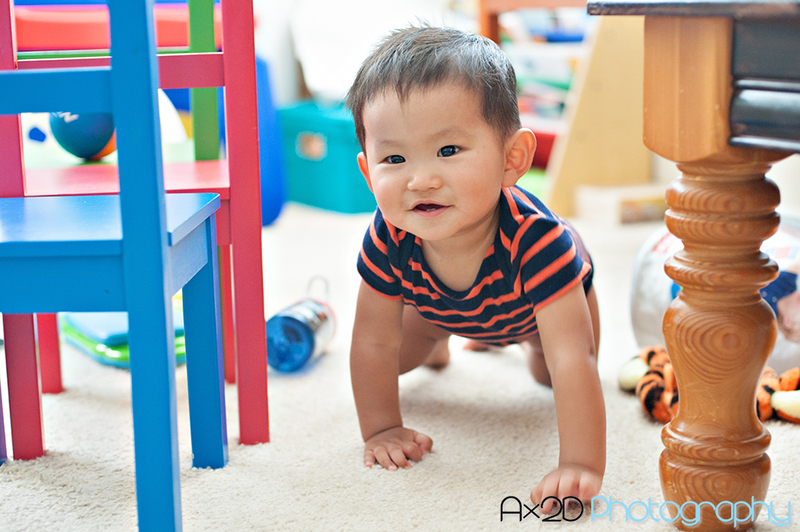 Asher definitely fell over more often than he used to. But with the DOC band, his neck is probably a lot stronger than if he didn’t wear it. 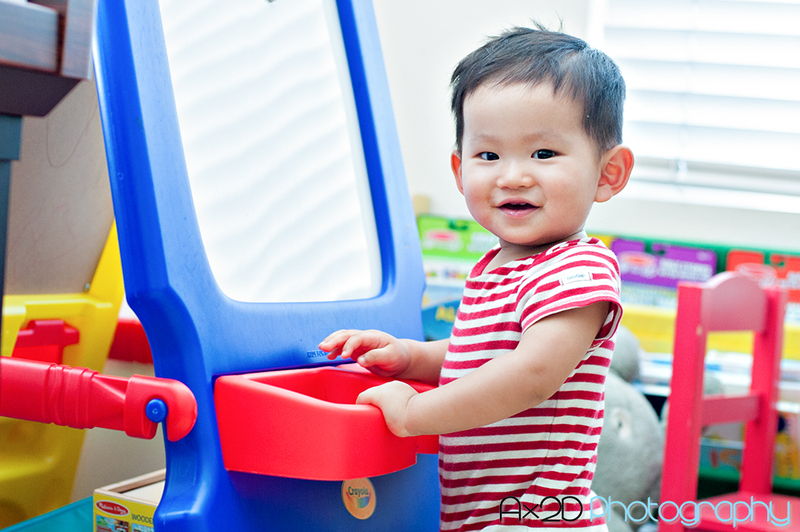 Even after 1.5 months, he still falls over occasionally and plays bumper cars with it… just kidding. I venture that, when the band does come off, in July, he’ll probably need to relearn how to live without it. He’ll need to realize that falling down on his head does hurt and that if he bumps into something, he’ll no longer have something that pads his head. That will be a fun time (sarcasm). 6) What happens after the first fitting? For us, we’ve been meeting up with our clinician every 2 weeks. Each appointment has only been 15 minutes or so. During those appointments, the clinician readjusts the helmet by shaving parts off to redirect/or allow growth in certain places. So far, 2 months has gone by and just by looking at the pictures up above, you can totally see that Asher’s head has changed a lot. Even after the first 2 weeks, we could already see progress and his head slowly reforming. The progress is sooo encouraging. 7) Does it affect SLEEP O_o ? Asher didn’t need to be retrained and it didn’t bother him or affect his sleep. There are three annoying things about the DOC band and sleep. 1) Because the DOC band is supposed to be somewhat loose and not tight or unmovable, it will slip downwards and forwards sometime, forcing his eyes closed. 2) I’m so used to bundling up a baby for sleep. Honestly, babies do sleep better when they are warmer. With the DOC band on, they have a higher tendency of overheating. SOOO, we had to keep his feet open (no footie pajamies) and he’s usually in thinner clothing. On warmer nights, we usually put him in a short (goes up to his mid-thighs) tank or short-sleeve onesie TO make sure he’s not freezing, we would also put an A&A swaddle over him. On colder nights, we would put a long (goes to his ankles) long/short-sleeve onesie that goes sleep onesie still put a swaddle on him just in case it becomes too cold. 3) Totally personal preference but, as you can see from the picture below, we placed a blanket under his shoulder so it evens out a little because the helmet does add <1mm. This keeps his head and shoulders on a flatter plane. Without it, his neck loses support a little. I’ve also heard of some kid sleeping on their bellies, I actually don’t know whether or not that would be more comfortable, but in the end, your child knows best. If they end up on their belly and is breathing fine, that’s awesome. For ours, he hates being on his belly, so back sleeping has been his way to go. 7) Does the helmet stink after wearing it for 23 hours? Honestly, no.. but that may be depending on the child. Asher can sweat quite a bit but the helmet actually doesn’t smell too badly. 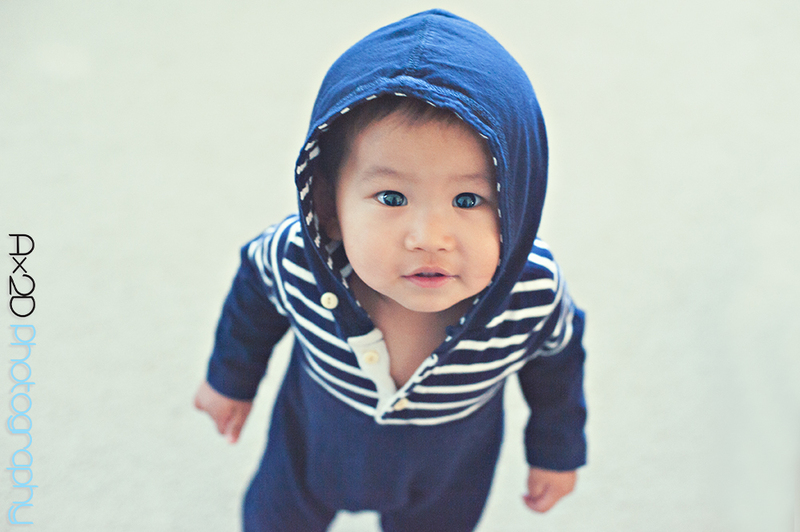 At first, I would wipe it down almost every time I changed his diaper or especially during the time he sweated quite a bit. But I eventually stopped because it didn’t make that much of a difference. I guess we were also lucky that Asher didn’t get the helmet during the hottest time of the year. So how do you care for the helmet? Everyday, during his 1 hr break/bath time, we would wipe/scrub it down using a spray bottle of 70% alcohol and a bamboo cloth. Your clinician may tell you to do something different so please follow your clinician’s instructions. Instead of a cloth, some people may use a toothbrush. For us, this has been fine and we’ve not had any problems with stinky helmets or allergic reactions. Our helmet is definitely brown in the areas where it puts pressure on his skull, but as you go through the treatment, they shave portions of the helmet off anyways, so there’s really no need to fuss about it all too much. I’m really glad that we made this choice. It has been educational and we’re grateful that we were able to give Asher the opportunity to develop the best that he can..
Why didn’t we decorate the helmet? We didn’t really want to and just haven’t had the time. I did some research and there are some artists that do hand painted helmets and some vinyl and sign companies that do design wraps for the helmets, either for free or for a long price. But for us, we were okay just leaving it blank. There is ALOT OF unintentional head butting.. it can hurt quite a lot for parents who aren’t used to holding a baby with a helmet. It’s not really all that much fun to hold a baby with a helmet while breastfeeding. But with everything, you’ll get used to it and barely notice it after awhile. There are pillows with holes and also a thing called Tortle. We tried the pillow with a hole, but our clinician warned against it because night time is when babies develop the most and often times they also practice what they try to learn during the day – such as rolling over. We wanted to try the Tortle, but Asher actually didn’t like the Tortle at all. He fussed over that and didn’t fuss at all when we put on the DOC band. Other than these things… it’s been a great experience. 🙂 We’ve been lucky to have so many supportive people around us. We definitely can’t wait to take it off in July. We’re so excited that maybe we might throw a party. LOL… we’ll see. UPDATE: Fast Forward to the… FINISH LINE and beyond! 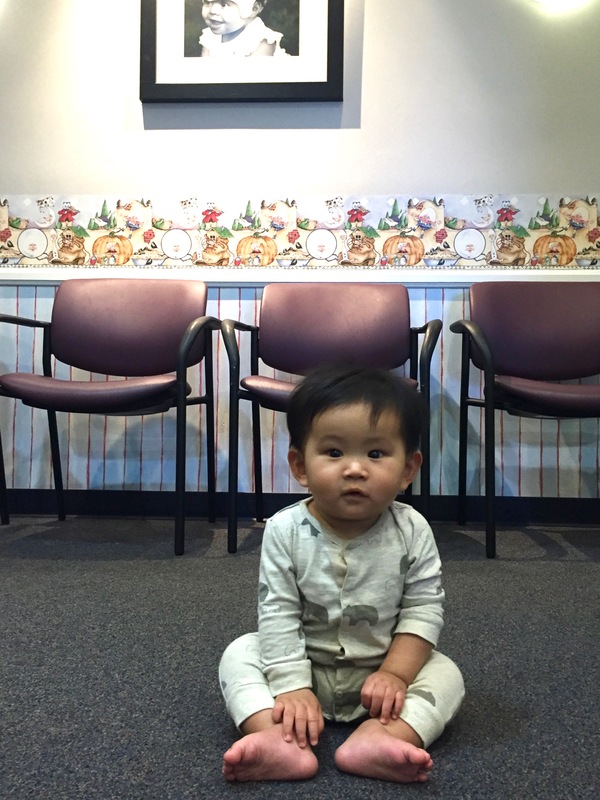 Asher first consultation was on March 24. 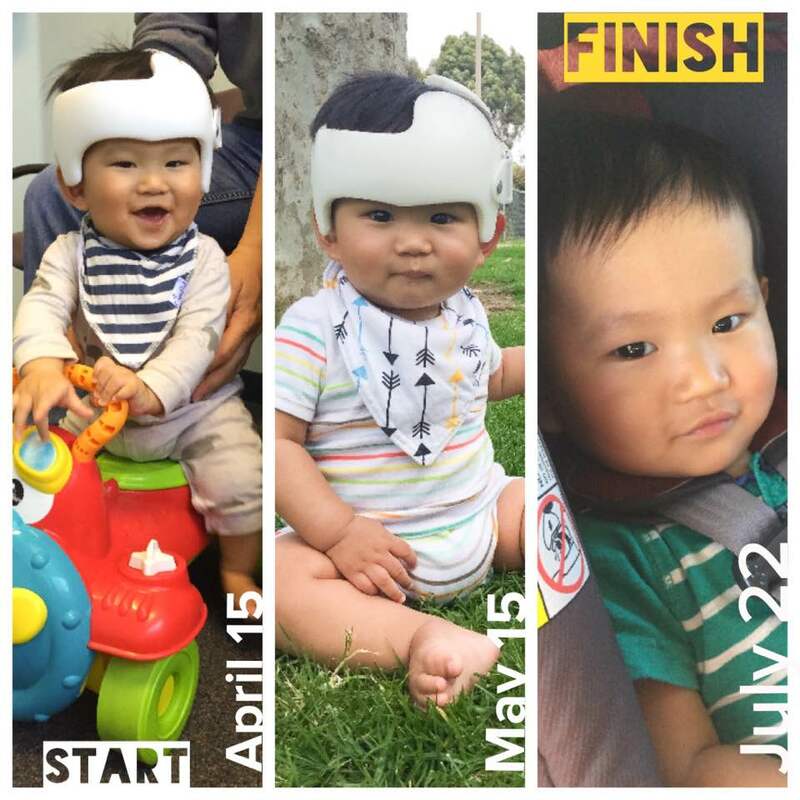 It took 2 weeks for the helmet to be formed and created and our fitting/start of his DOC band treatment was on April 15 (2016). He completed his treatment on July 22. Total treatment was 3 months and 1 week :). Seeing these images again, from the start to the end, it made me realize just how much he’s changed and how much he’s grown. Looking back, this experience was such a blur. But, looking back, I’m glad that we went through this – giving him every opportunity to develop at his utmost potential. When we hit the finish-line, one of the main concerns and questions we had was…..
1) Go with your gut instinct… If you feel something is wrong with the shape of the baby’s head or that you’ve noticed the baby’s movements restricted or that there is a habitual turning or falling into one direction due to a flat spot… go get a consultation. Better earlier than later and better now than never. 2) Ever experience is different. Not every DOC band experience is easy and not all DOC band experiences are the same. 3) With everything, it’s a journey that you learn as you go. 4) Don’t mind other people and their looks. Educate others when you can. You’ll find there are still a lot of really nice people out there that will encourage you for what you are doing for your child. 5) Everything will be a blur! 🙂 Enjoy every moment..
At 10.5 months.. our little Asher started walking. Helmet didn’t delay or stunt his development at all. He’s the same feisty, curious and confident little boy he always was.